A giant cauldron in the Forbidden City in Beijing, China. 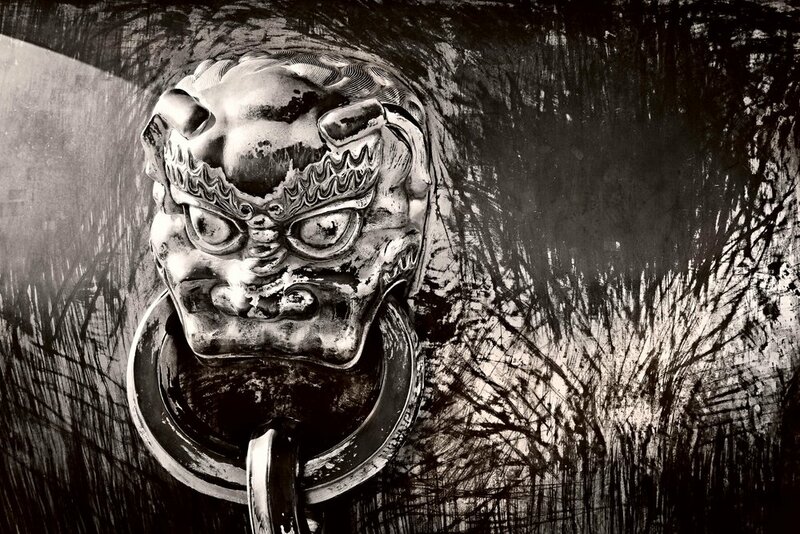 This photo features a detail of a dragon’s head on a huge, brass cauldron within The Forbidden City in Beijing, China. It's a fascinating location, particularly for anyone interested in architecture. I've been to the Forbidden City several times since my first visit back in, I think, 1989. The concept of space and the ability to move through it is evident as you explore the various buildings and structures throughout this huge complex. The image of a cauldron came out of frustration at having too many people moving, beyond my control, in and out of the frame. So, instead of continuing to wait, I decided to begin to look for details within this monumental environment. To add a sense of abstraction I moved in close to isolate the subject from its surroundings. The shape and textural qualities inherent to the cauldron suggested a black-and-white rendering was worth investigating. I processed the original RAW file and applied a subtle warm/cool split tone to the image. 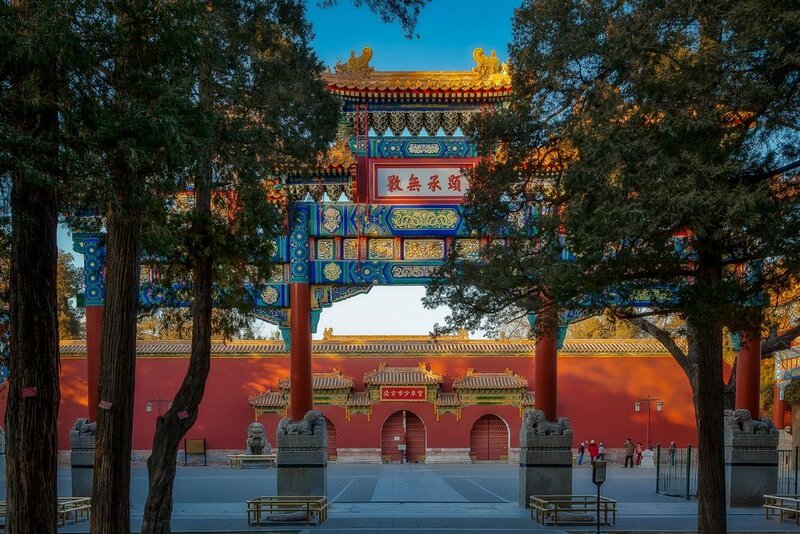 Red walls and orange tiled roofs against a deep blue sky on a spectacular winter's day in the Forbidden City in Beijing, China. Now that it's open to the masses, The Forbidden City is a very busy place with lots of individual and group tourists moving through this large and significant space. My most recent visit was on a cold (-4 Celsius) winter's day in January. Despite the brisk weather, the day was sunny and thousands of people, mostly Chinese tourists, moved through the complex during the few hours I was there. That many visitors can make it very hard to compose an architectural image that is free of people. Patience and good luck is required to get the image before one or more people move into your frame. I waited for about 20 minutes until there was a momentary break in the stream of people moving through the above scene of the colorful pavilions set against a vivid blue sky. I'm glad my patience was rewarded but, with so much more to see and photograph, sometimes a different approach is required. Three men stepping through an inner gate within the Forbidden City in Beijing, China. An alternative is to include people to help tell a story associated with the site in question. Timing was the key to photographing these three men. I'd just walked through this beautiful red gate and noticed the men walking towards me. I turned around, back tracked and set up my camera in a way that used the gate to frame the three of them walking through it. Fortunately they walked through, more or less, together and good timing ensured an interesting candid image. I like the fact that, while seemingly the same, each individual is slightly different to the other. When you find your ambitions for grand architectural images compromised by the crowds it's worthwhile making an effort to explore details on walls, doors, statues and the like. I love this image of light dancing on the side of a freshly painted window shutter. It's one of my favorites from that particular visit to the Forbidden City. And it came in response to not being able to make the kind of image I wanted to. As the saying goes, "Bend like a reed in the wind."